Mr. Carr: Boys and girls, who can tell me what they see happening? Jonah? Jonah: The rice is moving. Haley: The rice looks like it is dancing to the music. Mr. Carr: You’re right. It does look like that. Who would like to raise their hand and ask a question like a scientist about what you are seeing? Amelia? Amelia: Why does the rice do that? Max: Why does the rice want to do that? Does it like that music? Mr. Carr: I really like how you are asking such interesting questions. Let’s have one more. Leah? Leah: Does the music matter? I mean, will the rice dance to any kind of music? Mr. Carr: You all ask such good questions. You are wonderful scientists. Let’s give the rice a break and look over here where I have something else set up for us to look at. Mr. Carr turns off the music and shows students a ruler he has taped to a table. He hits the part of the ruler hanging off the table and asks students what they observe. Mr. Carr: What did you see happen when I hit the ruler? Juan: Yeah, it moved. But I heard it make a sound too. Mr. Carr: We call that super fast moving back and forth a vibration. Can everyone say that? Vibration. Mr. Carr: Vibrations are what make sounds. The ruler made a sound when I hit it because I made it vibrate. The rice danced because of the sound from the speakers. The vibrations from the sound caused the rice to move. Isn’t that cool? Ms. Sanchez leaves the room to go observe another class. Mr. Carr continues with his lesson. Mr. Carr and Ms. Sanchez meet later that day to talk about the part of the lesson that Ms. Sanchez observed. Ms. Sanchez: Let’s start with you telling me how you think the lesson went today. Mr. Carr: I think it was pretty good. I really liked how excited my students were about the rice. Ms. Sanchez: They certainly were! I thought that the demonstration was really engaging for your students. When we met last month we talked about how seeing scientific phenomenon and not just reading about them can be really important for science learning, so it was nice to see you do a demonstration in your classroom. Mr. Carr: They are so much more engaged now that I do more experiments. I like to save the reading for helping them understand more about the science after we do experiments. Ms. Sanchez: Great to hear. 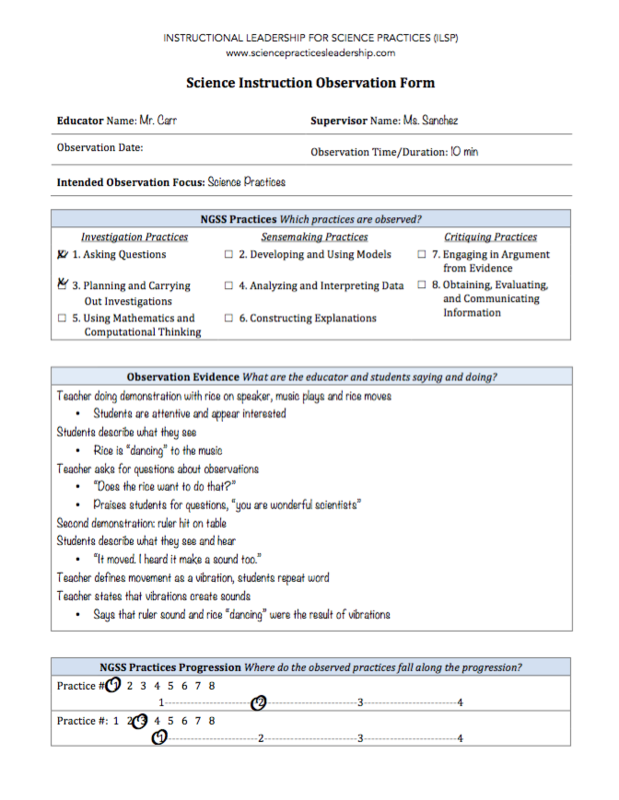 So, which science practices did you include in your lesson today? Mr. Carr: I wanted to focus on investigations. That’s why I showed the students the dancing rice and experiment with the ruler. I also let them ask questions. Ms. Sanchez: I saw those two practices also. Let’s focus on investigations, since that is what you have been working on. 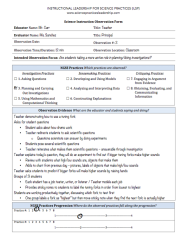 Do do you think you were successful in having students do or plan investigations? Mr. Carr: Well, doing investigations is new for me so I felt that I successfully incorporated investigations into the lesson. But your question was about the students doing investigations and so I would have to say that no, the students didn’t really do or plan anything. They watched me do it. Ms. Sanchez: Do you think that having a more active role would help your students understand vibrations better? Mr. Carr: Probably, because I really just told them what vibrations were at the end of the demonstrations. If they did the experiment then they might have more of a chance to figure it out on their own first. They might really feel the vibrations and connect that to the fact that there was sound. But I am a little nervous about having first graders be more active. What if they can’t handle it? Ms. Sanchez: That’s a really valid concern, but I think that if you are clear about the expectations you have for them and what they should accomplish, you will be surprised what they can do a little more independently. Maybe you could do something like what you do with book groups and give everyone a job to do? They seem to be able to handle book groups when they know what their job is. Mr. Carr: I never thought of doing it like that. I think they probably could. Ms. Sanchez: I also have a website here that I think might help you as you plan future lessons with investigations. It has videos of teacher talking about how they set up routines to help elementary students have more control over planning and doing investigations. 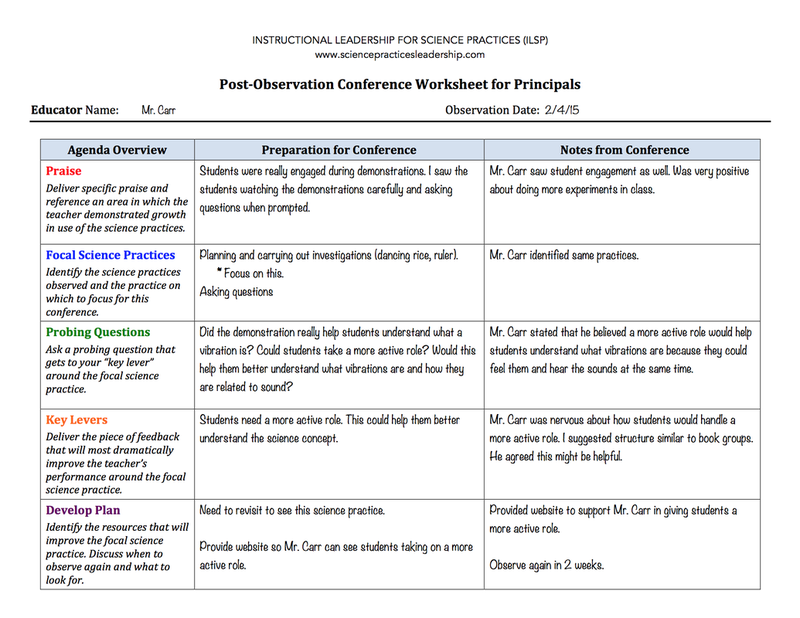 I think there are some parts that you might be able to implement over time in your classroom. Mr. Carr: That would be really helpful. Ms. Sanchez: When do you think I should come observe again? Mr. Carr: I want to have some time to watch the videos and find lessons where it makes sense to do investigations, so how about two weeks? Ms. Sanchez: That sounds great. The following week Ms. Sanchez stops in during one of Mr. Carr’s science lessons. Mr. Carr is showing students how to hit a tuning fork on their sneaker to make a sound. Mr. Carr: I wonder what questions we have about this. Who can ask a question that a scientist might ask? Greg: Is that how a drum works? Mr. Carr: That’s a good question, Greg. And we can figure that out, but let’s remember that scientists ask questions that they can do experiments about. Cara: Is the big fork louder? Mr. Carr: How could we answer that question, Cara? Cara: We could try all the forks and see if the sound is the same. I think the bigger forks will be louder. Mr. Carr: Good. Who can ask another question? Mike: It moved fast when I hit it on my sneaker. Mr. Carr: It vibrated fast? You’re right. So what question do you have? Mike: Do they all move that fast or do some go slower? Mr. Carr: Great. How could we answer that? Mike: We could test all the forks and write down if some go faster. Mr. Carr: Right. We could see if some forks vibrate faster. These are great scientific questions because we can find the answers by doing an experiment. Today we are going to find out if the bigger tuning forks make higher sounds. Who can remind me what are some things that make high sounds? Mr. Carr’s students name a few objects that make high sounds, like whistles and teapots, and then a few objects that make low sounds like tubas and dogs barking. As they name these, he adds the names and pictures of these objects to a chart on the board that the class created the previous day when exploring high and low sounds. Mr. Carr: Okay, now we are going to predict what will happen in the experiment. Remember, scientists do this too. Raise your hand if you think the bigger forks make a higher sound. Mr. Carr writes down how many students think the bigger forks make a higher sound, and how many think the bigger forks make a lower sound. He then puts students into groups of 3 to test the forks. Mr. Carr gives each student in each group a job: tester, writer, or listener. He explains and models what the jobs mean. He also gives sticky notes to label the tuning forks as “highest” “lowest” or “middle.” Then he sends each group to a specific space in the room. After observing the students testing the tuning forks, Ms. Sanchez leaves the room.